Agents can manually start an additional session when there are customers waiting in queue. Bold360 is configured to distribute chats automatically between available agents, but agents can decide to manually take an additional chat from the queue if they can manage the extra workload. For information on Automatic Distribution, see How to automatically activate chats (Automatic Chat Distribution). 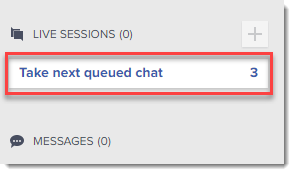 To start chatting with the customer who has been waiting for the longest period of time, click Take next queued chat on the left side of the workspace under Live Sessions. The chat is assigned to the agent regardless of the agent's status, and whether Automatic Distribution is enabled or the agent's concurrent limit is reached. Remember: This feature is enabled by default. If an individual agent cannot use this feature then at admin.bold360.com, go to Organization > Agents and select the agent. On the Automatic Distribution tab, make sure that Take Next Queued is selected. The chat opens in a new swimlane in the workspace to the right.